8 Should you buy one? 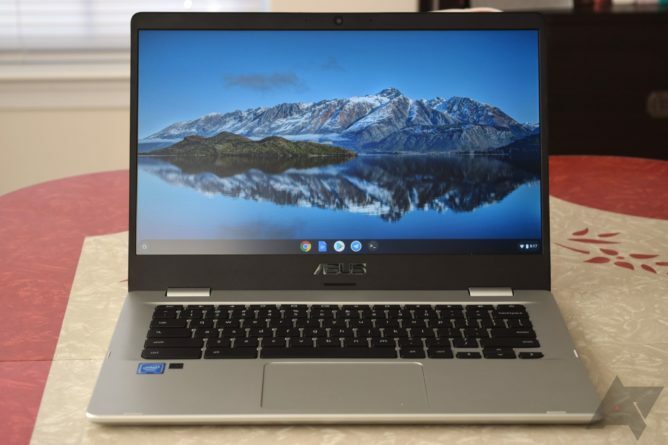 We've said before here at Android Police that Asus makes some of the best Chromebooks on the market, but bumps in the road are inevitable. Take the last one we reviewed, the C223NA. Corbin came away under-impressed, so we hoped that Asus' next offering would hearken back to what made us fall in love in with the Flip C302. Unfortunately, what I have here, the C423, does not accomplish that. From an underwhelming CPU to a meh display, my experience with the C423 I received was a mediocre one, which is about what one might expect from a $270 Chromebook. But even though I didn't like it at first, it grew on me the more I used it. Ports There is a good selection of ports on the C423. Each side has a USB-C and a USB-A, and there's even a microSD slot. Price It's a 14" Chromebook for $270. That's a cheap laptop, and there's something to be said for that. 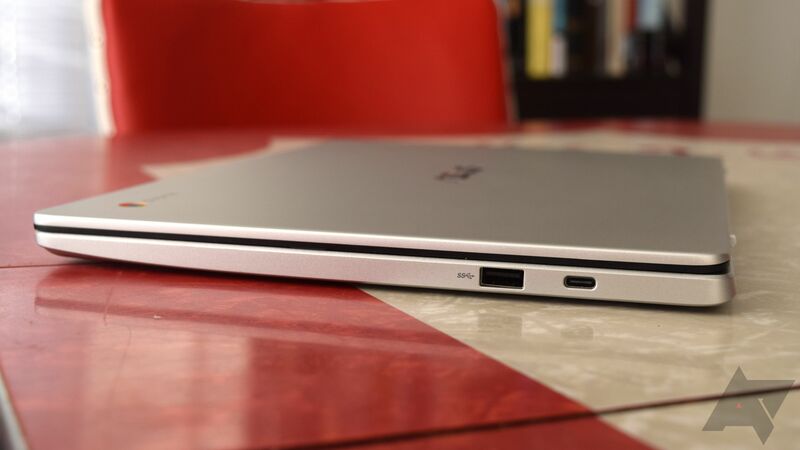 Design Overall, the design feels modern, especially for a budget Chromebook. Asus likes to brag about the "slim" bezels, so there's that. Build quality Along with looking nice, the C423 feels well constructed. There's a bit of flex in the bottom part of the case and the back of the lid, which isn't unusual. Performance We all know what the N3350 is capable of by this point, and it's not impressive. This is the single biggest problem I have with the C423, since it comes to a crawl with more than five tabs or a couple of Android apps open. Display Viewing angles aren't spectacular and watching media isn't all that great. It's about what you'd expect for a $270 laptop. Keyboard The keyboard is passable for some quick emails or social media posts, but the squishy, spongy keys aren't comfortable for long bouts of typing. Asus did a very nice job designing and building the C423. With a plastic body, it looks more premium than it actually is — that's not me taking a shot at the build quality, mind you. Thus far, I've been quite pleased with how solid this device feels. The main body has very little flex, except the middle of the bottom part of the case and the back of the lid. I was thrilled at the port selection, with two USB-C, 2 USB-A, microSD, and a 3.5mm headphone jack all on board. Each side of the laptop gets one C and one A each, which is great for using peripherals. Having a microSD slot was also great the handful of times I needed it. Overall, I like the look and feel of this Chromebook; it's quite light, making it well suited for carrying it to class, across your home, etc. The corners are rounded ever so slightly so that you don't put more unnecessary pressure on your wrists. 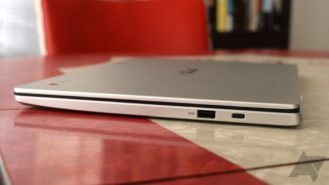 The lack of noticeable creaking leaves me with the impression that the C423 is built with more care and attention to detail than any Acer Chromebook I've used, even the Chromebook 15 from last year. 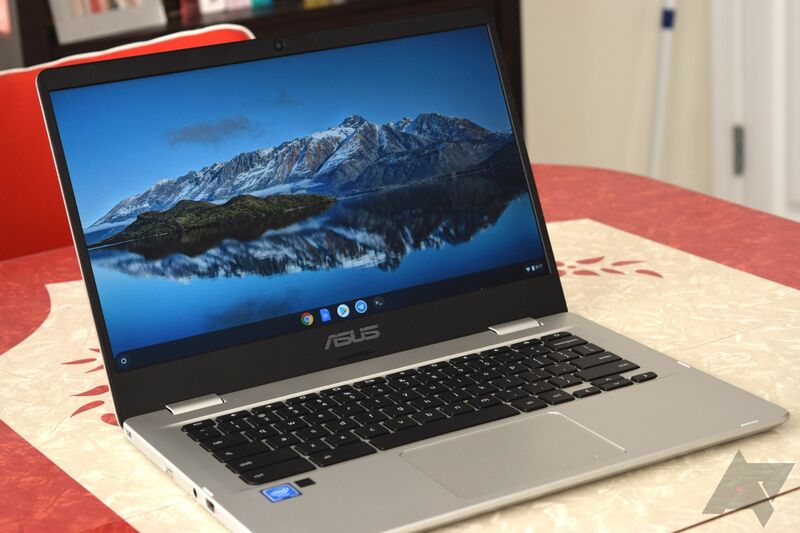 As with any budget Chromebook, there are plenty of shortcuts made to keep the price down. While not the most egregious I've ever seen, the keyboard and touchpad suffer somewhat to make that $270 MSRP. By no means bad, I find the keyboard to be okay for short bursts of typing, like replying to emails, composing a few tweets, and conducting some research on whatever topic I happen to be obsessed with on a given day. However, for longer bouts of typing, I find that it gets uncomfortable. The keys are squishy and spongy, requiring little force to press; it's also a bit louder than I'm used to hearing from a laptop keyboard. The plastic touchpad is nothing special, though it gets the job done. It's reasonably smooth, meaning that your finger shouldn't catch on it when you're trying to position your cursor. It's also a nice compromise between a massive Macbook-style island and something tiny (like you'd probably find on other budget laptops). The click itself feels hollow and I noticed some slight rattle when tapping. Second only to the performance, which I'll address below, the display is one of the C423's weakest areas — it is, in a word, underwhelming. Colors are dull, lacking any pop and consistency at different angles. On that note, viewing angles aren't great, with noticeable darkening at anything past head-on. 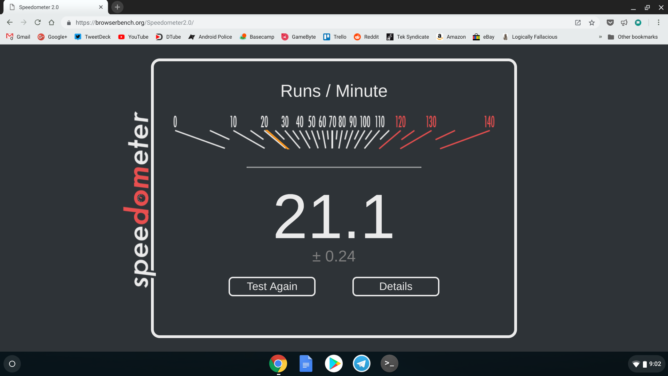 It isn't as bad the Chromebook 12 C223NA that Corbin reviewed a few months ago, but that's not saying much. Watching media is not a pleasant experience. Over my few weeks with it, I noticed that I suffered more eye strain than I'm used to with my other laptop and my desktop. Something about it consistently gave me a pestering headache. That's just my personal experience, so take it as you will. One of the best things about the C423 is the 10-hour battery life. That's pretty normal for Chromebooks, but having a laptop last that long is always worth noting. In my testing, ten hours was about right, but your mileage will vary depending on what you're doing, how bright the display is, and so on. Obviously. But now we come to the crux of the C423: performance. Inside, you have an Intel 3350, a dual-core CPU that hasn't impressed anyone for some time now, paired with 4GB of RAM. It does fine with basic tasks, but anything beyond that reveals a discernible drop in performance. When working, the amount of tabs I have open on my desktop or main laptop varies, but it's usually at least four. On a Chromebook, however, I keep the web version of Slack open since the Android app is an abysmal experience. At five or more tabs, I saw the C423 start to hang randomly with both the touchpad and keyboard becoming unresponsive. Obviously, adding more tabs (especially ones like YouTube) further decreased performance, especially with Slack open, too. As far as Android apps go, it's a similar thing that we've seen in the past. One or two apps is a safe bet, given that you only have a couple of browser tabs open. I usually kept Telegram up at all times and doing so didn't really impact my five-tab rule. But toss in something else like Spotify, Discord, or Snapseed and the system starts to drag. Granted, I didn't expect much from the N3350, but it's a cheap chip that keeps costs down. 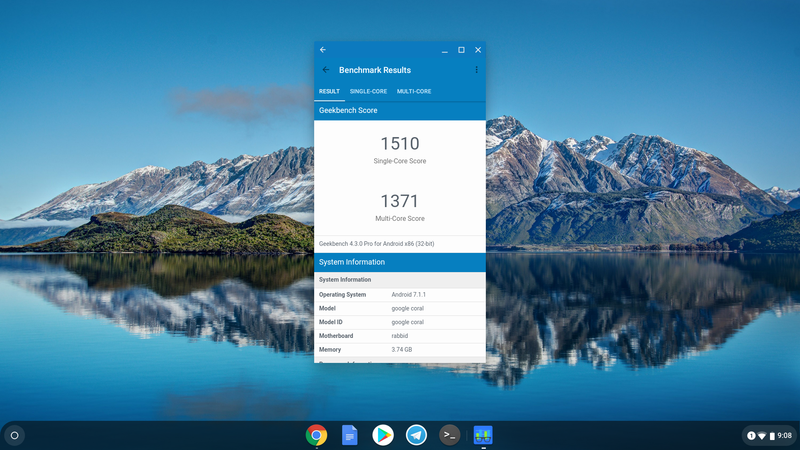 People don't buy inexpensive Chromebooks to replace their gaming laptops, but underwhelming performance is still worth paying attention to, especially if someone is planning to make this thing their daily driver. Maybe. If your budget is tight or you just want a cheap backup computer, then the C423 is a fine option. 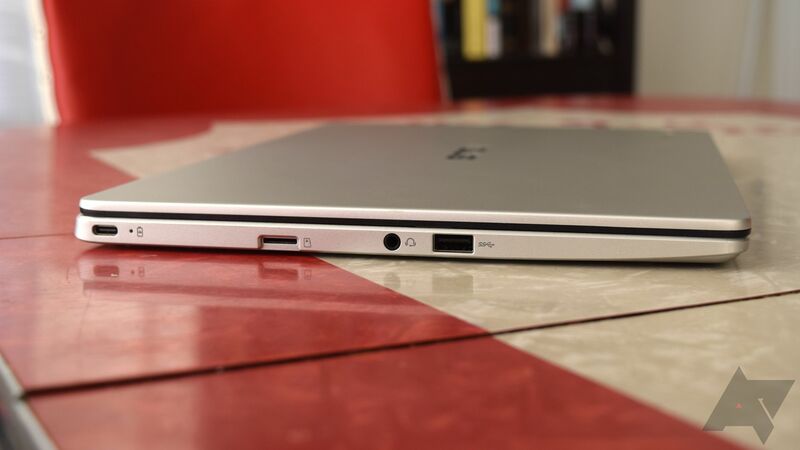 You get a large 14" display, great port selection, a decent keyboard and touchpad, and solid battery life. Just don't go expecting to do a lot of multitasking, at least not quickly. "It looks nice and gets the job done — it may not always do so as quickly as you want, but it'll get there." However, should you have slightly more to spend, the Asus Chromebook Flip C302 still remains a solid option. It sits at $499 typically, almost double the C423's starting price, but we've seen it drop to $399 fairly often. That Chromebook offers you a fully convertible experience, a metal unibody construction, much better performance, and a more appealing display. In case you were wondering, I wrote this review on the C423 and I even used some Linux applications like Firefox and GIMP successfully. 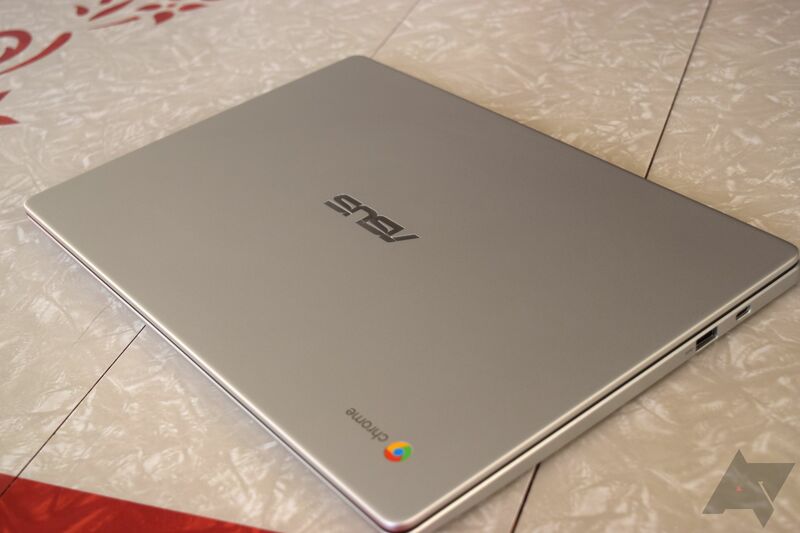 At first, I really didn't like this Chromebook, for reasons I still can't explain properly. The more I used it, however, I became more comfortable with elements that were initially off-putting, like the keyboard. 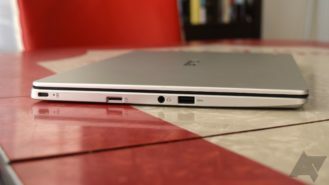 Coming from my excellent Matebook X Pro, I was a bit jarred at a lot of the C423's shortcomings, but that's not really important. At $270, I don't mind recommending the C423 to a specific type of person. 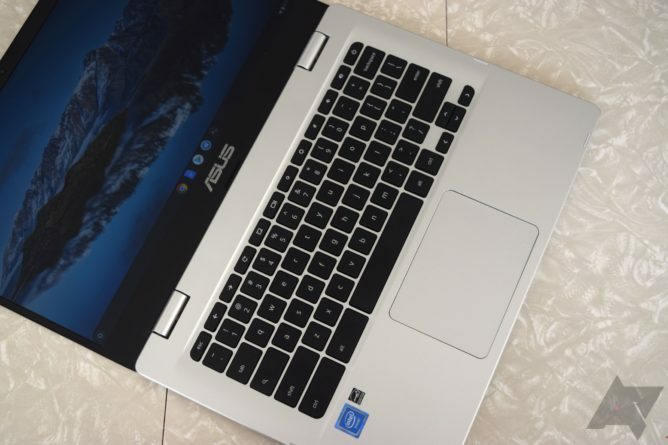 But as we saw over Black Friday, Asus has no problem knocking a few bucks off the asking price. All in all, it looks nice and gets the job done. It may not always do so as quickly as you want, but it'll get there.